By now we know that it’s imperative to have accurate, engaged email lists if we want to maintain a strong sender reputation. 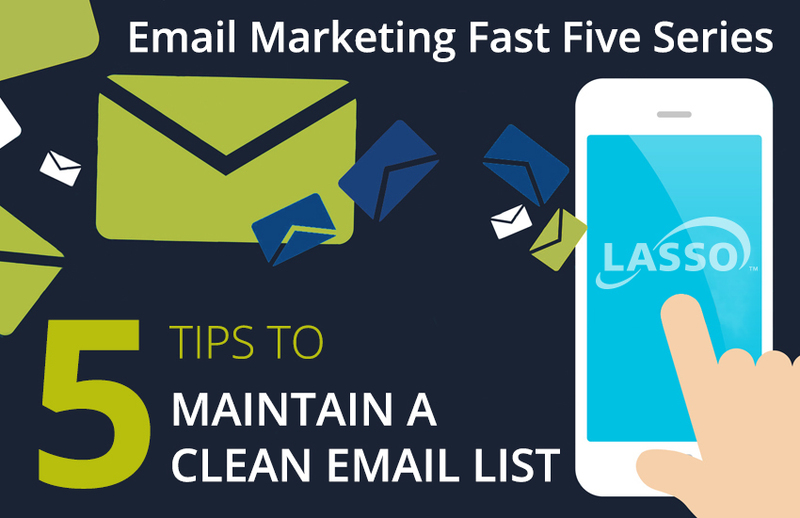 (We talked about it in the Fast Fives article, “5 Ways to Build Your Best Email List“). The reality is, it can take a lot of work to clean up our lists. While true that it’s easiest to maintain a database by tending to it on a weekly or monthly basis, most of us haven’t found the time to even start! Regardless, as responsible marketers, it’s something that must be done. According to Return Path, there are a number of factors that affect sender reputation, including email addresses that no longer exist, unopened emails and spam complaints. In this post, we outline 5 tips to get started with cleaning up your lists. If you commit to doing these 5 things on a regular basis, and a little at a time, your sender reputation will improve. More email will get to the people who are most interested in your homes. Hard Bounce: The email address no longer exists. In this case, remove the email entirely from the database. It may be necessary to call the recipient to get a new email address. Soft Bounce: Email could not be sent due to an issue with the recipient’s mailbox (ex. mailbox is full). If the email consistently soft bounces, contact the recipient to get an alternate email address. An email could fail because of a technical error, like a typo or misspelling. Other reasons include network errors or data format errors. These are typically a quick fix. An email could also fail because it is a duplicate. Lasso will only send to an email address once, but records are generally more accurate when there is one email address associated with one database profile. 3) Check for duplicates before importing lists. While Lasso can automatically check for duplicates upon import, it’s important to scrub your lists before the import to make sure leads aren’t entered twice. People may use different emails for different purposes, but you don’t want to risk a spam complaint by sending one person multiples of the same email. Take the time to merge duplicates and designate which email addresses should be primary and secondary. 4) Pay attention to ‘out-of-office’ replies. When you send a marketing email, undoubtedly you receive a number of ‘out-of-office’ replies. Read all of these! Most are announcements of vacations and maternity leaves, but some let you know that a person no longer works for a company or that they’ve changed email addresses. Updating the record immediately will save you time and, potentially, a bounced email in the long run. 5) Launch a re-engagement campaign. There may be people in your database who haven’t engaged in a while (longer than 6 months), but their email addresses are still valid. Send them an email asking if they’re still interested in receiving your information. If they’re not, remove their email. If they are, ask them to opt-in. You may be surprised at the results. According to Mike Lyon, a re-engagement campaign can yield a 5% lead-to-appointment conversion rate. Bonus Tip: Avoid purchased lists! Build your database the reputable way by leveraging website registration forms, social media lead ads and contests, and sales/marketing events. By doing so, you ensure that email recipients have opted in to receive communication and are genuinely interested in your homes. Purchased lists are usually dated and contain old email addresses, and are often riddled with addresses specifically created to catch spammers. Plus, there’s no guarantee that the people on that list are interested in buying real estate. It’s always better to have a small, engaged database that increases your sender reputation, rather than a large, messy, unknown database that, more often than not, will lower it.